I’ve been slow to get things on the website. For that I apologize. It has been a hectic season, and I want to share with you some of the stuff we’ve been working on and what will be coming up. Last Sunday was the congregational meeting where the proposed budget for next year was presented and we walked through a discussion of moving from vision to mission. The previous post highlights that separately, but a lot of time and effor have gone into pulling those things together. We will have a thanksgiving service on Wed, Nov 25 at 7 PM. Come sing and give thanks before the eating of the bird. 1) On Friday’s during Advent I will be hosting dinner. Twelve is roughly the comfort level for a family style dinner, so I’m taking reservations for you or any guests that you might like to invite. Give me or the office a call to reserve you seat at an Advent dinner. 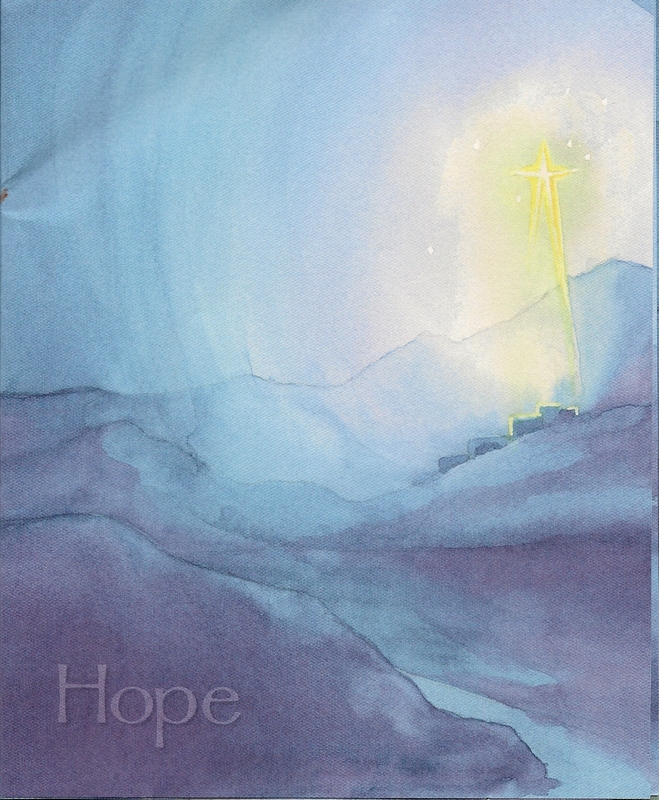 2) We will be publishing an Advent devotional booklet. In preping for the season I came accross a gorgeous series of what were supposed to be bulletin covers (peek below). They will be the book covers and the theme of each weeks devotions. 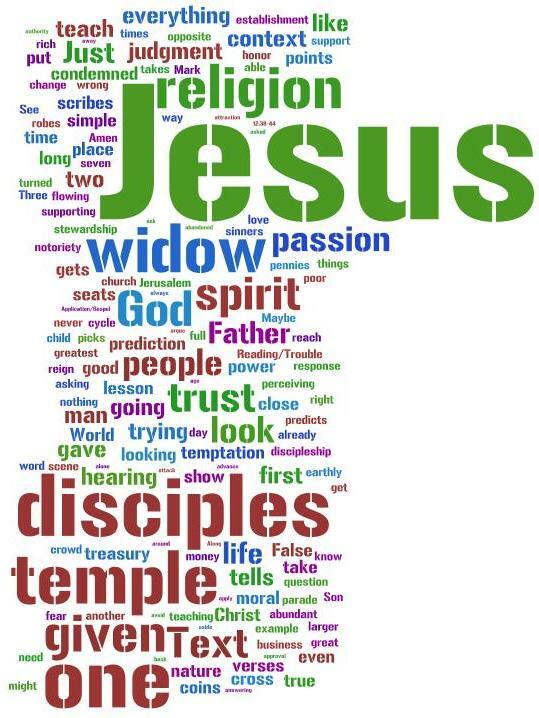 I’ve been preping a basic lutheran teachings class that will start on Dec 6th in the 11 PM Sunday School hour. For anyone who would like to consider formal membership – this is the class. We will be using the Augsburg Confession as the source material. This should last about 6 weeks or longer depending upon class interest. I’d invite everyone to attend. It would be great to be forced to move rooms. The confirmation class has passed out of the Old Testament overvew and is now reading the Gospel of Luke. And that doesn’t touch on Community Lutheran, Operation Christmas Child, the fixing of the water drain and other other stuff going on. The attached presentation below was published in the newletter and was present at the 11/15 congregational meeting. At the last congregational meeting me present a vision for St. Mark. The response has been positive and the phrase we’ve been using is that is appears people have “bought into” the vision. Almost literally as our pledge drive to make the budget has been successful. Now comes the harder part. Making that vision a reality. Giving form and structure, time and funding, to what has been nice words and feelings. Every healthy and successful congregation has two to three missions that taken it outside of its walls in service to their community. In this congregation we have been blessed with one such mission that now is the time to refurbish it – the preschool. We also need to spend the time thinking and praying about what the next mission might be as we move toward health. The plea at the end is for members who want to help in setting the direction of the preschol. I’ve got 4 members. We will meet probably 5 times for 1 hour a time over the next couple of months and present the collective ideas and outline to the coucil in February. Short term need that could have a large impact. If interested, give me a shout. We are contingent creatures. That is a fancy way of saying we depend upon other people and things. Some of those people and things are big foundation stones that if a crack showed up in them, we’d just not know what to do. And that is the problem. When society seems to be falling down around you, when those big foundation stones are crumbling, is your whole life overturned…or are you able to stand in spite of the loss. In the Holy Spirit we are made to stand. 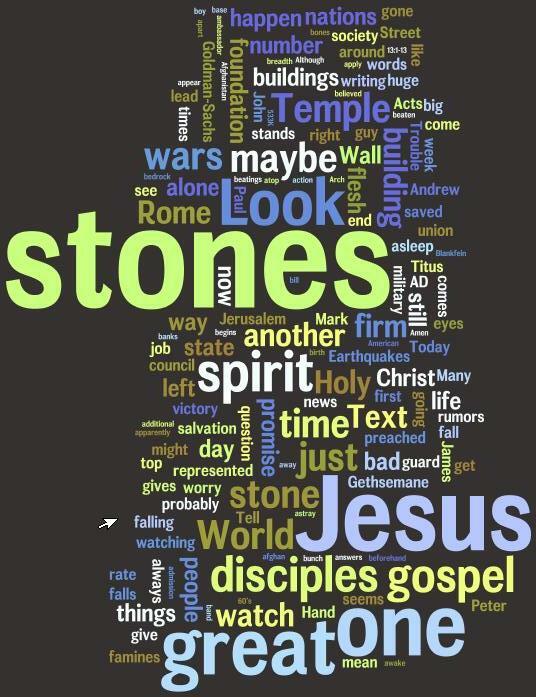 We aren’t promised that our stones won’t be toppled over. In fact if we’ve been listening to Jesus following him probably makes that more likely. What we are promised is one standing with us. Jesus Christ on the throne has poured out his Spirit. I got to deliver this sermon to two different audiences on the same day – the congregation here at St. Mark and the student mission at RIT. The full copy is the congregational delivery whic some things were modified for the RIT community, but it always amazes me that what preaching and the gospel best talk to is universal. The form of the questions and the searches might appear different, but the core concerns are the same – purpose, guilt, acceptance, love. We like to ask questions that quantify those things. When we do that, we always end up in the red. We can never find enough of any of them. Instead we need to aks who. Who has has the power and love to accomplish those things we so desperately need. Who have already given all? That man on the cross. That is the Gospel – everything really needful has been supplied in full. Looking at the passage for today those in Corinth are hungry for what Paul calls spiritual gifts. If you read closer you realize that these spiritual gifts are not the list of love, joy, peace, patience, etc but are manifestation of the Spirit such as speaking in tongues. Paul directs them instead at two things: 1. prophecy and 2. building up the church. I could be wrong here, but that word prophecy is not the popular imagination of telling the future, but simply the speaking of the Word of God. At a minimum, that is supposed to be the guy in the pulpit. Now I’m sure there are many times when what that guy says sounds like he is talking in a tongue, but it should go beyond that. We should not be looking at speaking the Word to God alone in showy babbling tongues, but speaking the Word to each other. Instead of being foreigners to each other, we are to be brothers and sisters. Instead of looking for ways to look holy without saying anything, look to build up the place where we meet prophets and hear the Word. Is there some way that you can share the Word of God and prophesy to your brothers and sisters? For most of the church’s existence in the US, it has had a cozy relationship to the culture. A Christian could blend in. Those days are ending fast. The church will need to adapt to being pilgrims or strangers in a strange land as the Bible would say. And that is going to be very difficult. Let me just say two things about this sermon: 1) I really hate it as a sermon. I think it misses the audience, doesn’t point to Christ enough, lacks a real solid textual foundation and doesn’t have the unity of message it should have. 2) I think some of the parts of it by themselves are bleeding raw and cut right to the heart of life. Modern life has lost the saints and the One who makes them and as a result is childish and soulless. We can’t see the problems even though they are right before our eyes. Being a Christian is a call to a life with a larger canvass, not a safe harbor. Any sermon is a balance or weaving of separate threads. I have a comfort zone being very textual. In my own walk I can’t get over the fact that God speaks in this book, and I want to know as much about it as possible. That comfort zone moves through to application. Basically I have about five outlines: Very simple text-application, a little more complex 4 pages outline with the four pages being trouble in the text, gospel in the text, trouble in the world and gospel in the world (the individual pages can come in any order, when they are text, text, world, world it reduces to text-app), a three point outline (have something to say and say it well, or if you took debate/speech this tends to be a classic argument outline), a question and answer outline, and a refrain structure (multiple images or examples from life that end with the same biblical refrain). All of those outlines are about relating the text we are reading to our lives, or in reality relating our lives to the text. You could say I’m usually about trying to get people to let the biblical text read their lives. This sermon had a different basis in that the liturgical day (All Saints Day) was really the theme. Textual exposition was greatly reduced and the theology of being a Saint was brought forward. 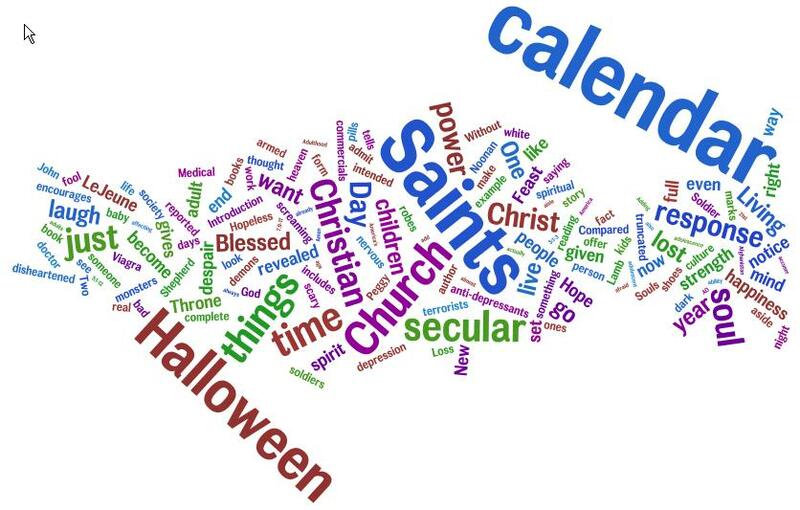 The general outline was compare and contrast – living life and interpreting reality from a secular veiwpoint alone (living with a calendar that only has Halloween) and living life with a church calendar (living with All Saints). Instead of being textual this sermon was theological and thematic. It needed to be better.